Devin Shore scored a pair to extend his lead in the AHL scoring race to 15, but the Stars ultimately fell 5-4 in their first ever contest with San Jose. The goals extended the rookie's scoring streak to six games. The game keyed on five minutes in the second period that saw Texas' 3-1 lead evaporate thanks to three quick goals from the Barracuda. Maxime Lagace took the loss with a 28 save effort. Devin Shore scored a pair of goals to extend his goal-scoring streak to six games, but the San Jose Barracuda stuck with 48 seconds left in the game to prevail over the Texas Stars in a 5-4 final on Saturday afternoon at SAP Center. It was the Stars' (11-8-0-1) first loss on their four-game trip to the West Coast. Along with his record-setting tally, Shore also regained the overall lead in the AHL with his 15th goal of the season. Nickolay Goldobin scored twice for the Barracuda (7-7-0-3) in the win. The Stars and Barracuda face off again at SAP Center on Sunday at 5 p.m. CST. Texas opened up the scoring with the first period's only goal as Justin Dowling fed Matej Stransky on an odd-man rush for his fifth of the season at 11:36. The offensive flood gates opened in period two and both teams combined for six goals on 22 total shots starting with Shore's first of the game at 4:14 from the slot from Brendan Ranford and Travis Morin. San Jose answered back with Joakim Ryan's first of his pro career at 9:38, but Shore made it a 3-1 score on the power play for Texas for his league-leading 15th of the season less than three minutes later. From there the Barracuda rattled off three straight goals starting with Goldobin's first of the contest at 14:10. His second came just over two minutes later to knot the score, and Barclay Goodrow pushed the Barracuda in front with 10 seconds left in the frame, on the doorstep, to make it 4-3. The scoring cooled off in the third until Esa Lindell found a loose puck at the side of the goal crease with just under two minutes to play and slipped home his sixth of the year to tie the game again. The goal extended Lindell's point streak to five games, but the celebration was short-lived as Julius Berman deflected home the game-winner with 48 seconds left in regulation to hand the Barracuda the win. Maxime Lagace stopped 28 of 33 shots in his first start since being recalled from the ECHL and suffered the loss. Troy Grosenick earned the win stopping 26 of 30 shots in net. Texas extended their power play goal streak to seven games and finished 1-for-3. San Jose went 1-for-5. HDH: What is this team's identity right now? Who should we be looking out for? TH: The Barracuda are still struggling offensively and rely heavily on their top line, which is where all their big guns are stored: Bryan Lerg, Jeremy Langlois and Ryan Carpenter. Not only are they the scoring leaders for San Jose, but leaders in the dressing room as well. When Nikolai Goldobin is with the team he is a solid contributor, showing his skill with the puck both with goals and playmaking. He's been recently sent back down and was in the lineup when the Barracuda played Charlotte. Trevor Parkes is another to watch out for. They are offensively gifted but tend to give up a lot of odd-man rushes, their achilles heel this season. I think their defense is still trying to figure themselves out and they are a young group, their board battles need to be stronger and the neutral zone seems to be wide open especially against teams who thrive on transition games. HDH: What's the goaltending situation like? TH: It seems like they are getting the goaltending they need on the ice but not the run support to get the wins. With Grosenick and Dell, the Barracuda have some solid goaltending on the ice. Grosenick has seen more action and had an outstanding game against the Stockton Heat stopping 49 shots before facing a shootout which saw the Heat come out on top. Grosenick is a netminder who is consistently looking to improve his game and takes each loss as an opportunity to get better. Both goaltenders are pretty much even in starts and Dell has one more loss than Grosenick. I think for both of these guys, it is solid defensive support that is lacking. The defense backs into the zone too much and it doesn't give either of the netminders time to see the shot in time to make a quality save. Both of them can deal with traffic in front of the net. HDH: The Texas-based Allen Americans are the Sharks' ECHL affiliate. Any thoughts on the connection so far? TH: The Barracuda have brought up a few guys from Allen and several (Arsenaeu, Crane, Steffes, Hanson) were with the team to capture the Kelly Cup last season. The most recent callup Hanson is fitting in well with the rest of the Barracuda, contributing 2 goals since being brought up. The Sharks organization has consistently had success with their minor affiliates in developing goaltenders and the Americans are no exception with Rumpel and Gill showing talent between the pipes. HDH: Like Texas, special teams appear to be a struggle for the Barracuda. What's not clicking? TH: Near the bottom on the kill and middle of the pack on the power play. I think it relates back to struggling to establish a strong position on the puck, too many turnovers make it difficult to get anything going on the PP and the struggles defensively that they suffer from full strength bleed over into their kill time. HDH: What has the callup situation been like with the Sharks and Barracuda sharing the arena? TH: The Sharks have been taking full advantage of the next door nature of their AHL club. The Sharks have been trying to find the right combo of chemistry and it is almost a guy a night (Lerg, Goldobin, Mueller, Haley, Karlsson, Goodrow,have all been up and down) in the recent past when the team has been at home. I don't think this has done the Barracuda any favors especially early on in the season as they have tried to establish an identity and line chemistry. TH: Attendance hasn't been stellar and it is a big arena which makes it feel even more empty. I imagine the players notice this at home and there may be something to be said about the Barracuda's poor performance at home and the lack of energy in the home barn. 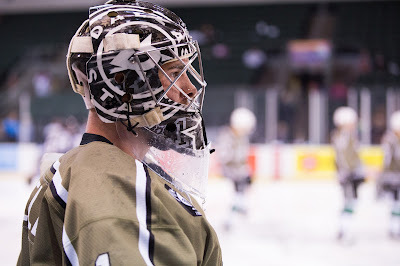 As expected, Texas has recalled Maxime Lagace from the Idaho Steelheads. The move was necessitated by the recall of Jack Campbell to Dallas this morning. For all his success in the AHL, Lagace has had a rough go of it in Idaho. He's gone 1-3-0-2 with a .891 save percentage. Either he or John Muse will start Saturday against the Barracuda. The Texas Stars, American Hockey League affiliate of the NHL’s Dallas Stars, announced Thursday the club has recalled goaltender Maxime Lagace from their ECHL affiliate, the Idaho Steelheads. Lagace (luh-GAH-say), 22, has appeared in seven games this season for Texas with a 4-3-0 record, a 2.60 goals against average and a .913 save percentage. During his time in Idaho, the 6-foot-2, 185-pound rookie made six appearances with a 3.24 goals against average and a .891 save percentage. The Stars continue their four-game swing along the West Coast on Saturday when they visit the San Jose Barracuda at 3:15 p.m. CST. The first bit of big injury bad luck has hit the Dallas Stars with Kari Lehtonen's upper body injury from the Ottawa game on Tuesday night. Jack Campbell has been recalled to backup Antti Niemi for at least Friday's game and possibly longer. The Campbell move suggests that Maxime Lagace will rejoin Texas before Saturday's game against San Jose. Patrik Nemeth ended his conditioning assignment as we recalled as well. The release, which you can read below, notes that the conditioning assignment was 14 days. However, Nemeth's assignment to the Texas Stars actually spanned 15 days with games played on both the first and the last day. According to the CBA, a conditioning assignment may not span longer than 14 days. It is unclear if this assignment violated those rules, and the Texas Stars did not respond for comment on the matter. According to the Dallas Stars, conditioning assignments do not begin until the first full day of assignment. Because Nemeth was assigned midday on the 11th, the counter did not start until the 12th. Dallas Stars General Manager Jim Nill announced today that the club has recalled defenseman Patrik Nemeth and goaltender Jack Campbell from the Texas Stars, Dallas' top development affiliate in the American Hockey League (AHL). Nemeth, 23, completed his 14-day conditioning assignment in Texas by registering one point (0-1=1) in seven games played. He has appeared in two games this season for Dallas registering three shots on net. Campbell, 23, began the season on the injured non-roster list after sustaining an injury during the preseason. Since being assigned to Texas on Nov. 7, he appeared in five games with a 2-3-0 record, a 3.97 goals against average and an .877 save percentage. He is coming off a 30-save performance in a 3-1 victory on Nov. 24. Also, goaltender Kari Lehtonen was placed on Injured Reserve, retroactive to Nov. 24, with an upper body injury. Two games into the road trip, Texas has two solid wins. The Stars pushed around the San Diego Gulls this evening in southern California. After two period, Texas led 4-0. The Gulls found some life after the second intermission, potting a quick three goals to come within one of the tie. The captain, Travis Morin, cashed in to put the game finally out of reach. Jack Campbell (now recalled to Dallas) got his second start in as many games and picked up his third win of the season with 17 saves on 20 shots. The Stars were efficient in many ways in the game: 1-for-3 power play, perfect if untested penalty kill thanks to only taking one penalty, and outshooting their opponents 35-20. Esa Lindell opened the scoring in the first period on the power play. Brendan Ranford followed up with an individual effort to make it 2-0 after one. Devin Shore scored his team-leading 13th of the season and Justin Dowling dropped his sixth for the 4-0 lead after two. In the first seven minutes of the third, San Diego reinvigorated the hometown fans with three goals. Travis Morin cut that off at the pass to set the final at 5-3. Texas will stay in California for two in San Jose on Saturday and Sunday. The Stars will slip down the California coastline for a pre-Thanksgiving contest against the San Diego Gulls. These division-mates have never locked horns before and will play a total of six contests this season. San Diego is the affiliate for the Anaheim Ducks. While this is the first time Texas has played San Diego, it is not the first time they've seen a Ducks affiliate. in 2011, the Stars played the Syracuse Crunch in a home-and-home during their short stint as the Ducks' AHL club. Ray Emery, now with Ontario, won the only kids day game at the Cedar Park Center when they visited that season. The Gulls are also familiar in a few other ways. Their coaching staff is led by Dallas Eakins. The former Marlies coach, who was hired and fired by the Edmonton Oilers, has found respite in the AHL once again. Eakins has said that he's been very impressed with the fan support for the team, having only coached in Edmonton and Toronto, two hockey hotbeds. Two of the top scorers for the team are Chris Mueller and Nick Ritchie. Both are called up to Anaheim at the moment though. Mueller, who spent last season in Hartford, signed a nice deal with the Ducks to be a hired gun for the AHL side and contribute where needed in the NHL. It's a very similar task to what he was expected to do for Dallas. He fills the role well, having taken Texas to a Cup and Hartford to the Eastern Conference Finals. Nick Ritchie is Brett Ritchie's younger brother. A top draft pick in 2014, he won't be playing against his brother quite yet. Brett Ritchie is still out with an injury and isn't even on the trip with the team. He spent last night in Dallas watching the Ottawa game. Texas fans can circle December 31st as the first potential matchup between the brothers. Another big relief for Texas is not facing goalie John Gibson, who is in Anaheim as well. The Stars look to continue their winning ways against a team that is above them in the standings. I would call this a four point game, but the points don't matter. However, if the Stars win, they will move past San Diego on points percentage. Following Saturday's disappointing result in Cedar Park, Texas got a solid road win in Bakersfield tonight. Goaltending, which was a large part of the loss on Saturday, turned away 30 of 31 Bakersfield shots as Jack Campbell picked up his second win of the season. The Texas offense was steady but not explosive. They didn't need to be tonight with the goaltending they got and that was the difference. Matt Mangene, who continues to be solid whenever he rotates into the lineup, scored a power play goal to open the first period. Brad Hunt answered back on the power play a minute later but that would be all the scoring the Condors would muster. The second period found Devin Shore collecting his twelfth of the season off some bodies in front to set the score at 2-1. His goal would stand as the game-winner, his third of the season. Esa Lindell would pick up his third goal of the season to end the frame and that would settle the scoring in the contest. While it wasn't probably the best game Texas has played all year, it was a very efficient road win: the exact kind of win that Texas needed tonight. Tomorrow brings the first ever matchup against the San Diego Gulls. The Stars make their first-ever visit to the Golden State this week with four games against newly relocated teams across the state. The first matchup features a familiar opponent. Tonight finds Texas in Bakersfield pitted against the Condors, who they've already played twice on the season. Bakersfield is situated a little more than halfway on the route from LA and Fresno. The Condors home, the Rabobank Arena, was built in 1998 and seats a little over 10,000. Since these two last met on November 1, they've gone in separate directions. Bakersfield, which found itself in last place int he division on November 1st with a 2-5-0-1 record, has gone 5-2 since losing the the Stars that Sunday. Included among those wins was a quality W against Ontario, a 3-0 shutout of the reigning champs. Meanwhile, Texas has had the exact opposite record since then. After beating Bakersfield, Texas was 7-2-0-1 but then stumbled to a 2-5 record in their next seven games. 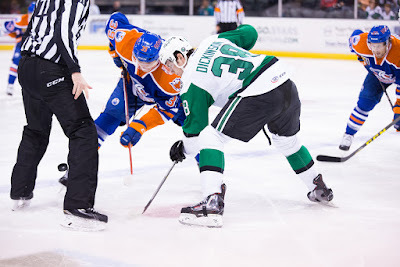 If the Stars lose to Bakersfield this evening, the Condors will slip past Texas and into the last playoff spot in the Pacific Division. Texas' current deficiencies were in full display on Saturday night. While they can score goals in buckets, the defense and goaltending is lacking severely. Coach Laxdal indicated there were a lot of blown assignments on defensive zone draws and plays in general that contributed to the inflated seven goal total that the Reign racked up at Cedar Park Center. He noted that his skaters needed to be open to the coaching and adjusting what they would do on the ice to suit the best needs of the team. Clearly, he feels that some players aren't responding to his play calls. On the topic of goaltending, Laxdal quite literally said "no comment" when asked about the level of play on Saturday. It's no secret that Texas needs better goaltending right now. Even league average goaltending would have won Saturday's game. 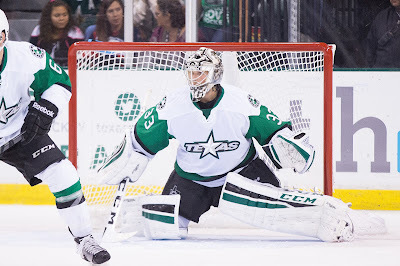 If Texas can't get that, it might be time to recall Maxime Lagace for a spark. In a contest between the two most recent Calder Cup champions, it's not clear it was the game that either team expected. Ontario and the Texas Stars combined for thirteen goals as the Reign took the first of six meetings between the two clubs tonight in Cedar Park. "That was nothing like our scouting report," said Devin Shore, who had three assists. "We thought it would be a defensive battle. It seemed like every shot was going in." The Stars battled back from separate two goal and three goal deficits in the game to tie things at two and six, respectively. Coach Laxdal pointed to the teams resiliency in those moments as a positive but was of course not pleased with the final result. Too many individual mistakes and blown assignments cost Texas the win this evening. Laxdal noted, "It takes a lot of energy out of you. You can't play like that every night, chasing the game." Texas was chasing the game nearly from the drop of the puck. Ontario scored on their second and third shots of the night, ending John Muse's evening just four minutes into the game. "I didn't like the first two goals. I thought about pulling Jack [Campbell] at six. We have to have our goaltenders step up. Goalie is the last resort. You can usually count one mistake, two mistake, three mistake, goal. There were probably three mistakes on every goal." Texas would even things up with goals from Greg Rallo and Devin Shore only to cede two back before the end of the frame, ending twenty at 4-2 down. Laxdal commented, "We had some breakdowns on the first three goals, leaving guys alone in the front of the net, a lazy habit." After getting a goal from Esa Lindell to open the second, the Stars let up two in quick succession to make it a 6-3 contest. Matej Stransky scored on the power play with a Reign defenseman draped all over him to cut the deficit to two after forty. The Reign used their size to their advantage all night, banging bodies with Texas and making it uncomfortable to go to the tough areas of the ice. "We thought Utica was big and heavy last year, so I can see why [Ontario, formerly Manchester] rolled through Utica in the finals." Devin Shore added, "We know if we want to make a push those are the teams and that's the style we have to play." Justin Dowling netted his fifth of the season early in the third period, a backhand rebound effort. Greg Rallo's second of the game set things at even late and gave Texas the chance they needed to take the W from the top team in the Pacific. With the building back in it, Jordan Samuels-Thomas scored what would stand up as the game-winning goal with 3:33 left in the game. Shore assessed the game, "We had a good push in the third. A lot of the mistakes are on ourselves. We shot ourselves in the foot." Coach Laxdal echoed the sentiment, noting that Texas had several mistakes on each goal that could have prevented them. With a young club, this will be a good game to study on the video before the next contest to determine where those breakdowns came from. The Stars get no quarter from the Thanksgiving holiday. It'll be spent on the road. Monday morning brings the team's first ever trip to California. One of the great things about having a community of writers covering the AHL is getting to pick their brains about their teams. It's what they know best. Robyn Pennington writes about the Reign at Jewels From The Crown, the LA Kings SB Nation site. The Reign are one of the five new California teams this year, but they just won the Calder Cup last season in Manchester. Tonight's matchup will be a contest between the two most recent Cup winners. Last night the Reign came out hot against the Rampage, going up 3-0 early. San Antonio clawed back to 3-3 but lost in overtime. Ontario moved into first place in the Pacific with the win. RP: The Reign are quite similar to their parent club in that they like to be a hard hitting, tough team to play against and the addition of a guy like Paul Bissonnette kind of falls in line with that identity. Coach Stothers really believes in this team's skating ability (and they actually have some pretty good skaters) and he's always saying that that's when the team is doing well - when they're skating. Like the Kings, they're also a strong possession team and love to play keep away with the puck. (According to Josh Weissbock, Ontario leads the league in est. Fenwick close% with 56.769%, nearly two full percentage points ahead of the second place Albany Devils). They really pride themselves on limiting shots against and creating scoring chances for. As for who to watch out for, Michael Mersch is always dangerous. He's pretty much NHL ready, but remains in the AHL until there's a roster spot for him. He also leads the league in shots on goal with 60, but somehow only has 6 goals. Rookie Jonny Brodzinski has been doing just about everything right, though he has yet to score a goal. He's incredibly snakebitten right now and could break out anytime soon. HDH: Can you do any compare/contrast this team to the Cup winning team in Manchester? What are the major changes? RP: Actually, for an AHL team, there hasn't really been a huge turnover from last year to this year. They lost their leading scorers in Jordan Weal (graduated to the Kings) and Brian O'Neill (traded to New Jersey), as well as defensive center Nick Shore (also graduated) and backstop J.F. Berube (claimed on waivers by the Islanders), but they retained most of the other moving pieces that were key in the Calder Cup run. One person who got hot in the playoffs was the Kings' 2014 first round pick Adrian Kempe. He spent most of the year in Sweden on a bad team that barely avoided relegation. Eventually, the Kings decided to take advantage of the European loophole and bring him over as an 18-year-old, something they hadn't really been intending to do earlier in the season. The Reign still do have Patrik Bartosak, who was solid in relief after Berube had gotten hurt last year, but he had a lingering thumb injury that worsened in the preseason and has caused him to miss the beginning of the season so far. The intention was to get him into a game during this Texas road trip but he has been suspended following domestic violence charges. HDH: Can you talk a bit about the season that Peter Budaj is having and how that's impacting this team? RP: Budaj is off to a fantastic start this season and is really enjoying a bounce back season from last year when he was mostly unfortunate not to get any wins with St. John's Ice Caps. The nice thing about this story is that it's really not all the team defense in front of him. On Nov. 7, Budaj stopped all 38 shots in a lopsided, penalty and fight filled affair in Stockton (a game with which Stothers was not pleased with his team's effort). He's smart with his rebound control and recovers well. He has four shutouts and league leading 1.28 GAA and 0.947 sv%. Given that Berube was claimed and Bartosak was out with an injury, he's really been a steadying force for some of the younger guys and rookies. He's been especially important since Ontario lacks some of the firepower that they possessed a year ago. 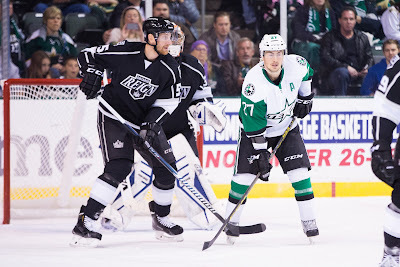 HDH: Sean Backman played for the Texas Stars many seasons ago. Since then he's gone on to win a Cup and becoming a big scoring threat. Due to him playing in the East, we haven't seen him since he left. What's his game evolved into since we left him last? Already sporting nine assists in 10 games, Sean Backman has truly been an unsung hero for an Ontario squad that looked like they would miss Jordan Weal and Brian O'Neill. He's a bit of a late bloomer at 29; as recently as a couple seasons ago, he wasn't even averaging half a point for Manchester. While his current point-a-game pace seems unlikely to continue, his production has certainly been trending upward, from 26 points in 2013-14 to 44 last year. Set-ups like this (featuring some commendable work from Valentin Zykov too!) have become the norm. HDH: What has the callup situation been like with Ontario being so close to LA? RP: With the Kings enjoying a run of good health, there hasn't really been much of a need to recall/send anyone down. The Kings were able to take advantage of Derek Forbort's waiver exempt status and sent him back for a brief conditioning stint earlier in the season after he missed some time while recovering from the flu. He played in two home games, then returned to LA while the Reign hit the road. When Forbort was under the weather, Jamie McBain was a surprise call-up and he flew from LA to San Jose in one afternoon and even played in that game, something not feasible before, unless the Kings were in the east. On Star Wars theme night at Cedar Park Center, the Texas Stars game on the ice was a three period microcosm of the first trilogy in the series. Coming off a three-game losing streak, Texas needed a good outing against a weaker opponent. The Checkers provided an opportunity to tune up before a big game against divisional opponent Ontario tomorrow. "We had a good start to the game," said head coach Derek Laxdal. "We stuck to our system, had trust in our system and ran four lines hard." Radek Faksa, who scored the game winner in Episode VI the third period, added, "Obviously it was very important to have this performance. It was important to bounce back and keep going on a winning streak." Gemel Smith had an excellent game overall and his line with Branden Troock and Derek Hulak provided the spark to take Texas to a 2-0 lead after twenty minutes. Smith beat Drew MacIntyre rushing in with speed down the right wing side to open the scoring. Derek Hulak tipped a mid-speed point shot through the legs of MacIntyre for the 2-0 lead. Aside from a short two minute stretch in the second, Texas controlled the game. Two questionable tripping calls put the Stars on the 5-on-3 kill and the visitors made both count. Justin Shugg went first with his third of the year. "[Muse] made a great save on the 5-on-3 but they got the rebound," explained Laxdal. Trevor Carrick scored off a screen play and it was tied at two after two. Knowing they needed a strong effort in the third, Texas wasted no time restoring their lead. Radek Faksa slipped one past MacIntyre glove side for the 3-2 lead just 16 seconds into the frame. Faksa, who had been skating with Shore and Stransky, started the period with Greg Rallo and Curtis McKenzie, a switch that provided the spark for the goal. "It was a very important goal to score on that first shift," said Faksa. "It was a lucky bounce for me." Justin Dowling potted a 2-on-1 goal with Jason Dickinson as the setup man two minutes later, and it was all Stars from there on out. To add to the excellent night, the Stars collected a power play goal, running themselves to a three-game scoring streak with the man-advantage. "Sometimes power plays go through those stretches where they aren't clicking," said Rallo, who scored the goal. "It seems the last few games we've been getting what we needed." The classic Rallo one-timer was a close-in shot this time, from the slot on what he called a broken play. "When they open up like they did tonight, a guy like Morin can find the seam pretty good and tonight he did." The Stars added an empty net goal from Shore to close the scoring at 6-2. Texas now gears up for a big match against Ontario, who defeated San Antonio tonight in overtime. Yes, Morin was at wing today. Laxdal said, "Sometimes when you have 3 high end skill guys on a line, it gets a little fancy. The past few games we ran it [that way] and it generated a lot of chances. I think it paid off tonight." Derek Hulak left the game in the third. Expecting he might be out tomorrow with an upper body injury. Following the NHL's announcement of a change to the All-Star format, the AHL also announced changes to their format today. It's not quite as extreme as the NHL's, which does 3-on-3 for the entire time, but it's definitely a big change. American Hockey League President and Chief Executive Officer David Andrews announced today a new game format for the 2016 Toyota AHL All-Star Classic, scheduled for January 31 and February 1 at the Onondaga County War Memorial Arena in Syracuse, N.Y. The 2016 Toyota AHL All-Star Challenge will take place on the evening of Feb. 1. Instead of a traditional 60-minute game, the league’s all-stars will be divided into four teams, one representing each of the league’s divisions (Atlantic, North, Central, Pacific). The teams will then play a round-robin tournament featuring six games of nine minutes each; the first half of each game will be played at 4-on-4, and the second half at 3-on-3. The two teams with the best records at the end of the round-robin tournament will face off for the championship, a six-minute game played at 3-on-3. Rosters for each team will be composed of 11 skaters and two goaltenders each. All 30 AHL teams will be represented by at least one All-Star player. The coach for each team will be the AHL head coach whose team has the highest points percentage in each division at the end of play on Dec. 31. The 2016 Toyota AHL All-Star Skills Competition on Jan. 31 will keep its traditional format, with the All-Stars from the two Eastern Conference divisions squaring off against the All-Stars from the two Western Conference divisions in seven skills events. 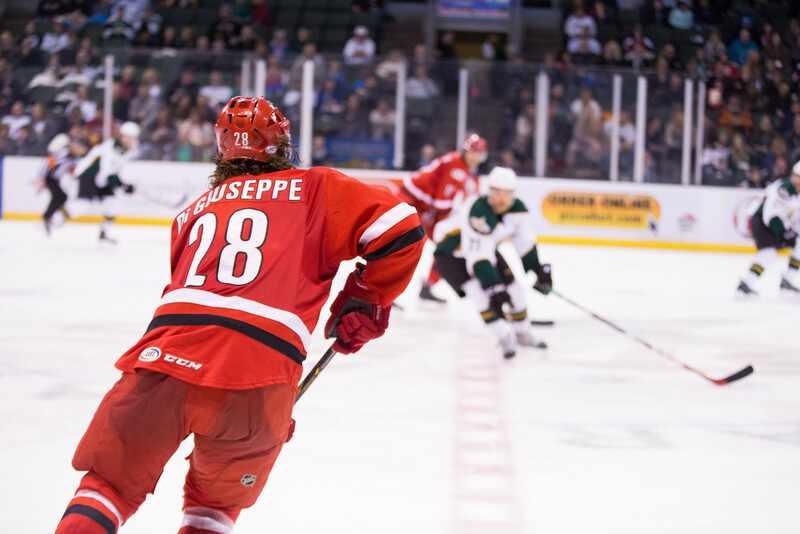 For the first time this season, the Stars will welcome the Charlotte Checkers to the Cedar Park Center. The Carolina Hurricanes AHL team has missed the playoffs in each of the past two seasons and is hungry to make it into the postseason despite their unique geographical challenges. I have to tip my hat to the Checkers, who could have balked at travelling to California this season. They will go coast-to-coast to play three of the five AHL clubs in the Golden State. In their quest to become a playoff team, the Checkers ousted the only head coach they'd known in the AHL: Jeff Daniels. He had led the club to the playoffs only twice in five seasons. Now the Checkers are headed up by Mark Morris. You may remember Mark Morris from the Stars' Calder Cup year. The smart money had Texas playing Morris' Manchester squad in the Calder Cup. The Monarchs were 48-19-9 that season and it seemed a good bet. That was until Morris and crew decided to cede home ice advantage in their best-of-five series against the Norfolk John Gibsons Admirals. The aforementioned goalie stole the show and put Manchester out. Morris followed soon after. He spent last season as an assistant for the Panthers. Lots of familiar names are back for the Checkers: Zach Boychuk, Justin Shugg, Danny Biega, Brody Sutter, Rasmus Rissanen, Drayson Bowman, etc. Charlotte has a few rookies worth watching, but the top one just got recalled to the NHL yesterday. Jaccob Slavin, a 4th round pick in 2012, has seven assists in 14 games and a team-leading plus-6 rating. Drew MacIntyre will return to the CPC with the Checkers once again. 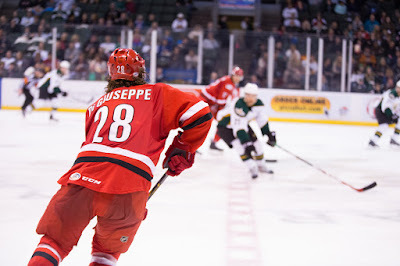 The goalie who stymied Texas nearly to the point of elimination with Toronto in 2014 is sporting a 5-6 record so far and definitely needs to be one of the best players on the ice for the Checkers, who only give up 27 shots per game (7th best) but cede 3.21 goals per game (7th worst). (Side note: This is John Muse's first game facing his former club, the only other AHL team he's played for). The Stars are looking to break their losing streak. With a few days off to reset and readjust, there are two possibilities. Texas could come out on fire and show that offense that they earlier this season. Or, the Stars could overthink things and not be able to click when it comes gametime. Just like Texas fell back on its systems in the early season when they could practice much, I'm imagining they concentrate heavily on their systems now to get them through a tough time where the shots just aren't going and goaltending isn't bailing them out. If the Stars can't win tonight, it doesn't get any easier tomorrow with the defending champion Reign in town. After that, it's a four game road trip to California. It was a brutal contest in San Antonio this morning. Not physically, but on the scoreboard. While the final score might not have reflected it, San Antonio owned this contest. The second period was particularly unkind with San Antonio marking four goals in the frame. A pair of third period goals were the only thing that broke up the crushing contest for Texas, but it was too little too late. The game marked the first loss for Texas in a 'kids game' since 2012. Jack Campbell took the loss, dropping him to 1-2 on the year, as Texas slipped into a three-game losing streak. Campbell stopped 22 of 27 shots in the game and slipped to a 4.53 GAA and .860 save percentage on the season. The first period went mostly fine for Texas. Despite a 1-0 deficit after twenty minutes, the Stars were definitely 'in the game.' Of course, the middle frame was where this all fell apart. 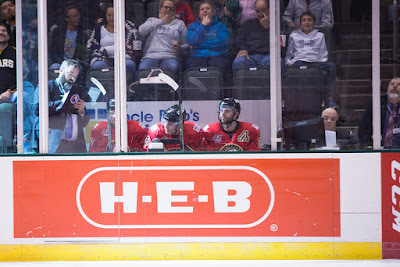 Andrew Agozzino scored first, then Michael Schumacher slipped in a puck on a play that was challenged unsuccessfully by the Stars coaching staff. Marc-Andrew Cliche scored off the ensuing faceoff to make it 4-0. With the Rampage shorthanded goal with under two minutes left in the frame, San Antonio had more goals in the second period than Texas had shots. The Stars finished with 7 as they had a power play to finish the frame. Texas collected a few tallies in the final frame to make the score look respectable. Goalie John Muse took the ice to start the frame, relieving Campbell. Devin Shore scored his first goal since returning from the NHL, a power play tally in tight and all alone in front of Spencer Martin. Matt Mangene scored on a tip in front off the shot of Brendan Ranford to make it a 5-2 Rampage lead. That play was unsuccessfully challenged by the Rampage coaching staff. The Stars will welcome Charlotte to the Cedar Park Center on Friday. Note that the Stars went with their 3 center lineup today. Each of the winger sets were kept together as noted while the centers rotated as well. With 14 games between the two teams this season, at least one of them had to be a kids' game. The San Antonio Rampage will welcome gaggles of screaming school children for a brunch-time matchup against the Texas Stars. This morning's game will also feature the return of Patrick Bordeleau to the lineup. Bordeleau was suspended for three games after he boarded Mattias Backman in the Stars' November 7th game against the Rampage. Backman is still out with a concussion following the hit. Bordeleau played in the next day's game but was then suspended for the hit. 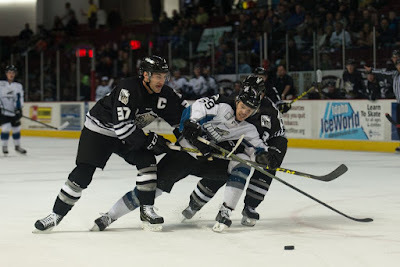 Texas got the better of the Rampage in every way but the final score, it seemed, on Sunday. They need to make sure they aren't distracted by Bordeleau's antics, if there are any, or tricked into getting a bit too aggressive in revenge. They will be aided by the return of Curtis McKenzie to the AHL. The winger was in Dallas but on injured reserve for the past few weeks. With the return of Patrick Eaves and Travis Moen, McKenzie was assigned. Coach Laxdal now has an embarrassing amount of offensive talent in his hands. Texas vaulted 47 shots on San Antonio on Sunday and 34 on Stockton on Saturday. At 35.36 shots per game, they lead the league and are, in fact, averaging a full 1.5 shots per game more than the next closest team (Ontario, 33.86). The fact is that Texas has been doing a lot of the right things but hasn't been getting the bounces and getting rewarded for it. PDO is a 'fancy stat' or 'advanced stat' that attempts to quantify luck. The league average for PDO is 1000 always (just like IQ is always average of 100 for a population). A team with a lower PDO is having bad luck; a team with a high PDO is having good luck. Take a guess what the Stars' PDO was for the past two games. So, yea, Texas hasn't been getting the bounces in any way. I didn't run the numbers for the whole league but it's reasonable to say that the Stars had some of the worst luck in the league this weekend. Chalk it up to that and keep plowing ahead. Good chance for a recovery against a good team with suspect goaltending this morning. 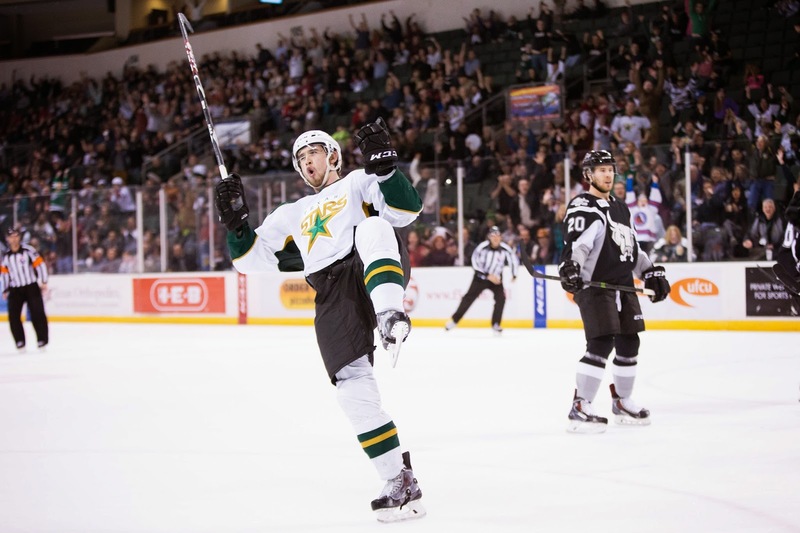 The Dallas Stars announced this afternoon that Curtis McKenzie has been assigned to the Texas Stars. McKenzie started the season with Texas but was recalled to Dallas almost immediately to fill injury gaps. McKenzie was injured himself and spent the last few weeks on the injured reserve in the NHL. With his return to health and the return to health of Travis Moen and Patrick Eaves, McKenzie can now safely be assigned to the AHL. With the assignment, Texas has no remaining players called up to the NHL. Emil Molin was also re-assigned to the Idaho Steelheads in a corresponding move. 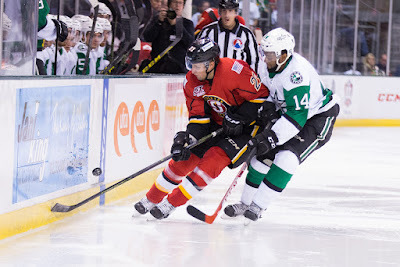 Dallas Stars General Manager Jim Nill announced today that the team has reassigned forward Curtis McKenzie to the Texas Stars, Dallas' top development affiliate in the American Hockey League (AHL). McKenzie, 24, appeared in one game for Dallas suffering a lower body injury in the contest. Prior to his game with Dallas, he played in one game with Texas and posted three points (0-3=3). The 6-foot-2, 205-pound native of Golden, B.C. was selected by Dallas in the sixth round (159th overall) of the 2009 NHL Draft. Despite a shots edge of 47-27, the Rampage got all the luck in this afternoon's contest in San Antonio. The Stars retooled and tweaked their lineup after a disappointing night last night against the Heat. It seemed like the retool worked in every way except for on the scoreboard. The Stars had far more shot than their opponents and tallied a power play goal to boot. Julius Honka was a healthy scratch for the first time ever with Texas. After a tough game, it's common for coaches to sit younger players to give them a chance to see the game from the press box view, which gives a lot more context for the overall action of the game. Honka is expected back on Tuesday. Additionally, Radek Faksa was a late addition to the lineup. Dallas played last night with Faksa logging 10:16 of ice time against Minnesota. 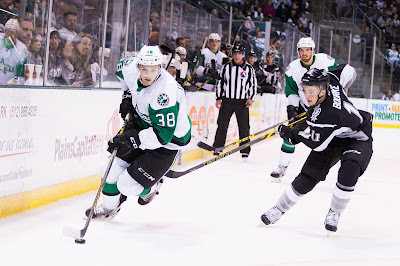 Despite 47 shots on goal and controlling the play for the final two periods, the Texas Stars fell short to the San Antonio Rampage on Sunday evening in a 3-1 road loss at AT&T Center. Spencer Martin stopped 46 shots for the Rampage in his AHL debut. Gemel Smith scored the lone goal for Texas (8-4-0-1) to extend his point streak to four games. The Stars outshot the Rampage 34-16 in the final two periods combined. The Stars and Rampage (8-1-4-0) hook up again on Tuesday at 10:30 a.m.
San Antonio jumped out to a 2-0 lead in the first off a power play goal by Maxim Noreau 1:22 into the game and Chris Bigras at 5:16 from the point. From there it was up to Martin to carry the Rampage the rest of the game. Smith snapped home his fifth of the season for the Stars from the right circle to snap a 0-for-15 drought on the man-advantage for Texas at 2:36 of the second. Stephen Johns and Brandon Troock each tallied the assists for their second straight games with a point and it made it a 2-1 deficit for the Stars. Late in the third Michael Schumacher added another for the Rampage, and Texas would pull John Muse for the extra attacker with about three minutes to play. Martin and the Rampage withstood the Stars' final push to hold on in the end. Texas finished 1-for-6 on the power play. San Antonio went 1-for-3. John Muse suffered his first loss of the season in a 24-save performance. When you're handed nine power play opportunities in a game, you can't say you had a good game if you come up empty on all nine. That's what the Stars had tonight in Cedar Park. Gift after gift for the power play crew from a delinquent Stockton Heat team gave Texas no help. In fact, the Stars gave up two shorthanded tallies in the game. "Any time you have nine power plays...," said Derek Laxdal, trailing off and not completing the thought. He continued, "Right now, our groups aren't working. There's no timing and no execution. We have to shake it up a bit." The Stars came out of the first period down 3-0. Laxdal noted, "The first period was our worst period all year. We had maybe two players who had jump. We were flat, as a group." The bottom six pushed the Stars back to even. Between Gemel Smith, Branden Troock and Cory Kane, Laxdal had praise for them. "That group stirred the drink for us tonight, but we need to have a little come to Jesus meeting here and talk about 'earned never given'." Late in the game, Blair Riley beat Jack Campbell to make it 4-3. The Heat would tack on an ENG to seal it up. The last time these two teams met, it was an epic 1-0 goalie duel. At least in terms of personnel, that is not possible this evening. Despite solid play, Maxime Lagace found himself as the odd man out on the Texas Stars roster and is now in the ECHL with the Steelheads. Jon Gillies sustained an injury last week. While it was initially put at 'day-to-day', the Flames later said that Gillies would miss 'some time' with the injury. Following that announcement, the Flames traded for Kevin Poulin. The new goalie rotation for Stockton is Poulin and Kent Simpson. Both tenders actually played in the Islanders' org last year. Poulin has a task in front of him with this Heat squad. However, he's going to need some run support from his offensive counterparts. Since their first game of the season against Rockford, where they slapped seven on the IceHogs, the Heat haven't scored more than two goals in any one game. The goals against numbers haven't been great, but the Heat aren't providing any sort of goal scoring for the team to work with as a whole. On Texas' side, they have an opportunity here to blow up offensively and provide another easy night for their goalie. The club is averaging 4.25 goals a game and just got one of their top scorers, Devin Shore, back in the lineup. With the recent outstanding play of Jason Dickinson also added to the mix, Texas could be very dangerous for a team with shaky defense. After Jack Campbell started in last night's game, it was only a matter of time before some decision had to be made regarding John Muse and Maxime Lagace. This morning, the Texas Stars announced Lagace's assignment to the Idaho Steelheads. Lagace will get a lot of ice time in a bid to keep him warm and continue the strong development he's done so far this year. 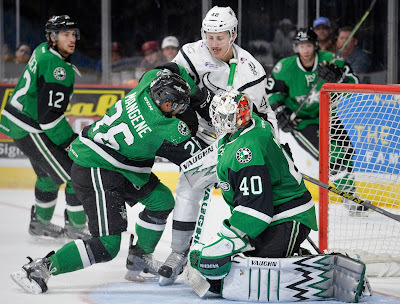 The Texas Stars, American Hockey League affiliate of the NHL’s Dallas Stars, announced on Thursday that rookie goaltender Maxime Lagace has been reassigned to the team’s ECHL affiliate, the Idaho Steelheads. Lagace (luh-GAH-say), 22, has appeared in seven games this season for Texas with a 4-3-0 record, a 2.60 goals against average and a .913 save percentage. The 6-foot-2, 185-pound native of Saint-Augustin, Quebec split 28 games last season at the ECHL level between the Bakersfield Condors and Missouri Mavericks with a combined 2.85 goals against average and .901 save percentage. In a game that had a much-hyped goalie matchup as recently as this afternoon, things really went in a completely different direction. It was an offensive showcase. Calvin Pickard, who stole the last matchup between these teams, was recalled to Colorado this afternoon. Then, Texas unloaded a magazine on backup Roman Will, providing more than enough run support for the season debut of Jack Campbell. "Jack was solid," said Coach Laxdal. "I thought he was trying to stay calm in net." "He made some big saves for us. It's just like a player going into his first game in a while. He's going to be a little rusty. It was great to get him run support so he could settle in. Jason Dickinson picked up two goals, including the game-winner, to extend his tally on the year to five. His second goal was a beautiful individual effort to pop the puck over goalie Roman Will, who had come out to play the puck, catch it himself, drop it and tap it into the empty net. "I was trying to chip it," said Dickinson. "I got a little lucky. The goalie hesitated on me so I got a lucky break there." Travis Morin and Cory Kane scored with two minutes of each other in the opening minutes of the first period. Brendan Ranford made it 3-0 on the seventh shot of the game before the seven minute mark and in any other game, you've got to believe that Will would have gotten the hook. Things were complicated by the fact that San Antonio had local amateur league goalie Rick Plester behind Will, providing no option for San Antonio's Dean Chynoweth to reset with a new goalie. Morin put in his fourth of the year on the backhand while falling down off the return pass from Justin Dowling. Cory Kane's tally came on a rebound of Matej Stransky's initial shot and marked Emil Molin's first AHL assist. Brendan Ranford made it look easy with a laser off the pass from Travis Morin and both of them had a goal and an assist. Texas had a 3-0 cushion. The Stars were outshooting the Rampage 12-1 midway through the period. To end the period, Jason Dickinson found twine on a steal and breakaway shorthanded. Low blocker on Will was good for his fourth of the year and Texas' fourth of the night. Dickinson noted, "As a kid, you're preached low blocker. I saw a good opening there and the goalie went for the deke." The second period saw an improved Rampage club. Will made some really solid saves that had the Stars looking skyward in disbelief. Quite a turnaround. "We had such a great start," said Laxdal. "You always try to reinforce a full 60 minutes. San Antonio gained energy in the second, and it was a good chance for our group to grow a little bit." Joey Hishon broke up the shutout for the debutant Campbell early in the second, but Texas had an answer. On a shift where a Texas goal seemed like an inevitability thanks to their zone possession, Greg Rallo potted his fifth of the year. In the low slot, Rallo one-timed a slick pass from Gemel Smith behind the net for the 5-1 lead. The Rampage came out strong to start the third period. "In this league nobody gives up," said Dickinson. "San Antonio has a great record and kept battling." Andrew Agozzino scored on a bang-bang play off a centering pass from Max Noreau. With Nikita Zadorov's point shot, the Rampage were within two and put the Stars on their heels. Dickinson's aforementioned beauty of a chip shot goal polished off the scoring and took the wind out of San Antonio's sails. These two teams will play again on Sunday. The Stars will play Stockton on Saturday. 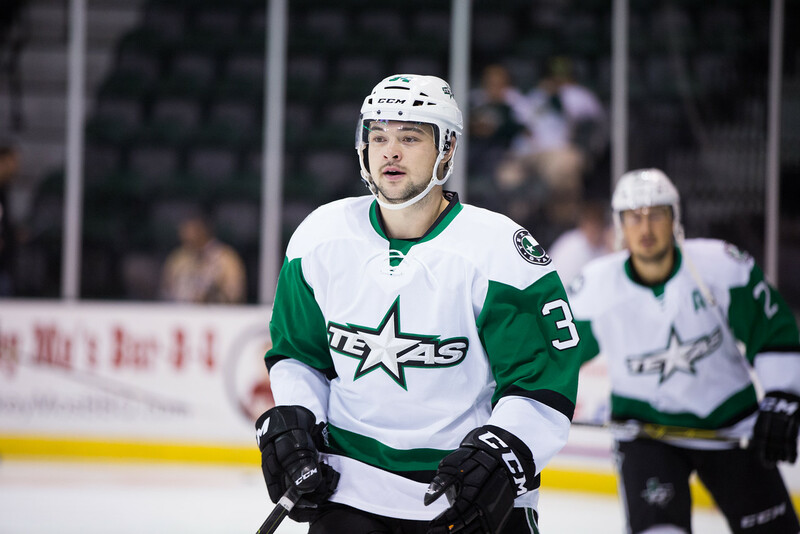 The Dallas Stars announced this morning that Devin Shore and Patrik Nemeth have both been assigned to the Texas Stars. Devin Shore is returning from his first NHL callup as the AHL's reigning player of the month. Nemeth is coming down on a conditioning assignment. The Calder Cup hero has only played in two games so far this season in the NHL. The conditioning assignment, which can span up to 14 days, is a good way to get the defenseman some ice time. With last night's game being in Dallas, both players are expected to be available tonight. 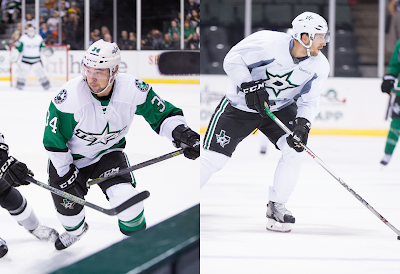 UPDATE: Devin Shore and Patrik Nemeth were assigned to the Texas Stars this morning. UPDATE 2: G Calvin Pickard has been recalled from San Antonio to Colorado. Well, it's Jack Campbell time in Cedar Park. 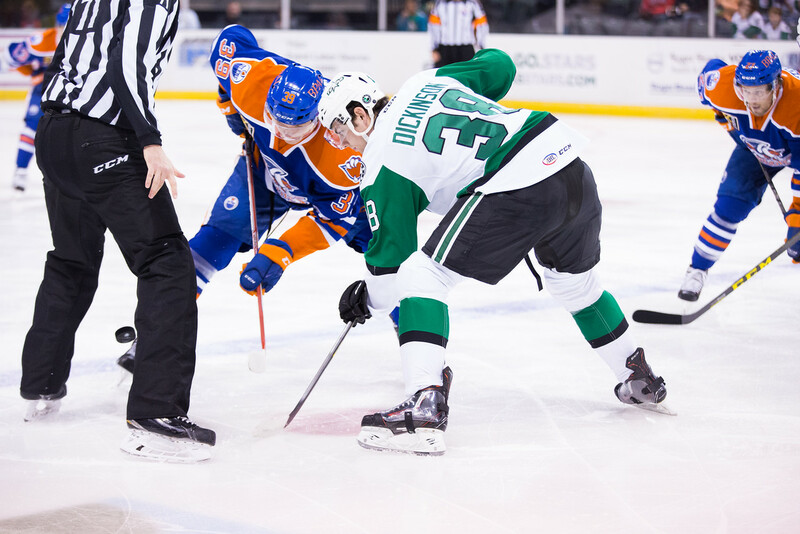 The former first round pick will make his season debut for the Texas Stars tonight against the Rampage. After getting injured in the preseason with Dallas, Campbell has been biding his time on the injured reserve, hungry for a chance to prove himself a worthy successor to the NHL throne. Meanwhile, of course, both Dallas and Texas have been getting solid, if not spectacular at times, goalie play from their existing combos. Antti Niemi, Kari Lehtonen, John Muse and Maxime Lagace all seem pretty well suited to their current spots in the roster shuffle. So Campbell adds a wrench. The team needs a winning goalie. It's pretty clear that the team can score, but so can others in their division. The top 4 teams in the Pacific are averaging 3.36 goals per game. You're going to need a goalie to steal a game. That's what San Antonio got from Calvin Pickard on Saturday. There's no reason that the Rampage should have been in that game after the first period Texas had. Texas knew it and so did San Antonio. Their saving grace was their saving ace: Pickard in net. If Campbell can't provide that edge and someone like Lagace can, it's going to be tough to get consistent ice time. The show is Campbell's to steal; he's getting ample opportunity to do so. The Stars will be without Mattias Backman tonight. The defenseman was concussed in the previous game with San Antonio. The perpetrator, Patrick Bordeleau, has been suspended by the league for three games and will miss games against Texas tonight and Sunday. Patrick Bordeleau has been suspended for three games following his hit on Texas Stars defenseman Mattias Backman. Bordeleau was assessed a boarding major during the game. Backman did not return to the ice. San Antonio Rampage left wing Patrick Bordeleau has been suspended for three (3) games as a consequence of a boarding incident in a game at Texas on Nov. 7. Bordeleau was suspended under the provisions of AHL Rule 28.1 (supplementary discipline). He will miss San Antonio’s games Wednesday (Nov. 11) at Texas, Friday (Nov. 13) vs. Stockton and Sunday (Nov. 15) vs. Texas. The Texas Stars have recalled forward Emil Molin from ECHL Idaho. The young forward has nine points in eleven games. Texas plays again on Wednesday. The Steelheads are about to depart for a road trip that will span nine games and take them past Thanksgiving. Next home game in Boise is December 2nd. 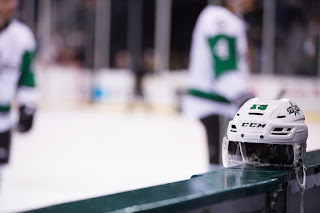 The Texas Stars, American Hockey League affiliate of the NHL’s Dallas Stars, announced Monday they have recalled forward Emil Molin from their ECHL affiliate, the Idaho Steelheads. Molin (moh-LEEN, eh-MEEL), 22, has recorded nine points in 11 games this season for the ECHL’s Idaho Steelheads on four goals and five assists. The 6-foot, 185-pound native of Gavle, Sweden was a fourth-round pick of the Dallas Stars in 2011 (105th overall). The rookie forward also won the silver medal with his home country of Sweden at the 2013 World Junior Championships. 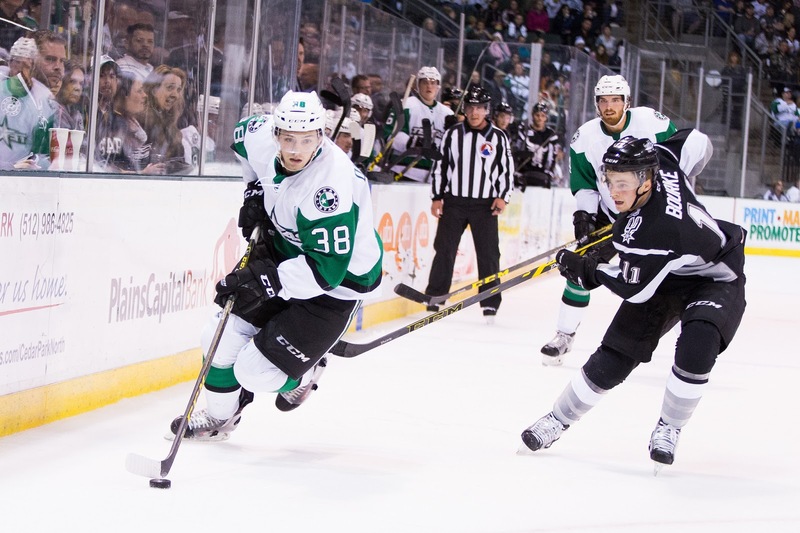 The Texas Stars host the San Antonio Rampage on Wednesday at 7:30 p.m. at Cedar Park Center. The Stars believe they deserved a better fate tonight. Some solid goalie play from San Antonio and some unfortunate missed calls by the referee conspired to take down Texas by a 4-3 mark. "I thought our guys deserved better," said Coach Derek Laxdal. "It was probably the best 60 minutes we've played all year. [Rampage goalie Calvin] Pickard was the difference in the game." The Stars came out very hot in the first period, dropping 17 shots on Pickard. Texas was coming off a week of rest and the Rampage were a bit weary from last night's game against Chicago. Despite all their good work, Texas ended the period with a scoreless tie. "Their goalie carried them through the first 20 minutes," said Laxdal. Jason Dickinson, who scored in the third, added, "The last two games, we let in some goals early and had to battle back. We knew they would come out fast. Their record shows they do that on the road every game. We were satisfied to come out and not be in a hole." Gemel Smith broke the scoreless tie in the first with his third of the year. Before the goal announcement could be completed, San Antonio had answered with a goal that rolled up over Lagace's glove and in. Four minutes later, a misplay behind the net from Lagace put San Antonio up 2-1. Mikko Rantanen scored both goals. Joey Hishon completed the second period scoring for San Antonio with a perfectly timed redirect on the power play. 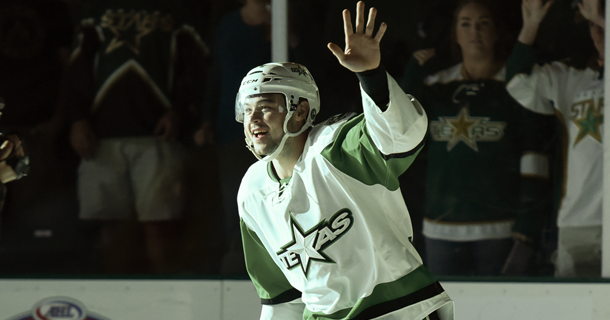 Trevor Cheek tallied his first of the season to open the third and the Stars were in a 4-1 hole. On consecutive shifts, Andreas Martinson and Jesse Blacker got roughing minors and then Stephen Johns and Duncan Siemens picked up fighting majors after a spirited bout. That play inspired the Stars to drive for the tie. Jason Dickinson scored on one of the prettiest goals the Stars have had all year, breaking past two defenders to beat Pickard clean on the ice. "It's hard to score on him," said Dickinson "He's a good goalie but we need to bear down on our chances. I was just lucky to get enough speed coming down the middle that he was caught and couldn't get across in time." Patrick Bordeleau got a little too much into the "spirited" part of the game and went head hunting on Mattias Backman. As Lagace headed for the bench on the delayed call, he went for another hit on Dickinson. It wasn't quite as thunderous, but Julius Honka hauled Bordeleau down in the fracas and just started wailing on him. Backman left the ice and has a 'mild concussion' according to Laxdal. "We'll let the league deal with that," added Laxdal. The major that Bordeleau picked up for the hit was partly negated by Honka's roughing minor. Joey Hishon took a slashing minor and put Texas on a 4-on-3 power play. Justin Dowling cashed in, not giving up on a puck that Calvin Pickard thought he had covered. Pickard was not pleased with the call. "There were some antics on the ice with the goaltender on the ice mocking the referee," said Laxdal. "That's not professional." Texas had a ton of chances as time wound down, even collecting a 6-on-4 with 46 seconds left. A blown call by the linesman on an icing with just seven seconds left put a faceoff at center ice and eliminated any chance of the Stars' tie for overtime. These two teams will face again in three of the next four games. UPDATE: Jack Campbell has been assigned to the Texas Stars. For San Antonio, G Calvin Pickard will start. Andrew Agozzino and Marc-Andre Cliche are out for the Rampage. After not playing the San Antonio Rampage for nearly a month, four of the Stars next five games are against their only remaining in-state rival. The first game of the season for both of these clubs was the electric 5-4 overtime victory spearheaded by now reigning AHL Player of the Month Devin Shore. Both teams walked away with at least one point that night, and between the two of them, they have failed to collect at least one point in just two of their combined 17 games to date (12-2-2-1). To this point, in fact, the Rampage have yet to collect a regulation loss. It seems as though the next few games could really feature a battle of the titans in the Pacific, if not the Western Conference as a whole. Texas and San Antonio are really showing their mettle as power teams in the newly formed division. The AHL announced today that Devin Shore has been named the AHL's Player of the Month for October. Shore was in close competition for Rookie of the Month surely with Providence's Frank Vatrano after tallying 11 points in the month. His collection of the overall Player of the Month award is a big win for the rookie. It probably didn't hurt that his club is 7-2-0-1 while Providence is 3-4-3-0. Shore is with Dallas at the moment and could make his NHL debut tonight in Boston. The American Hockey League announced today that Texas Stars center Devin Shore has been selected as the CCM/AHL Player of the Month for October. Shore tallied eight goals and three assists for 11 points along with a plus-7 rating in nine games for Texas during the month. 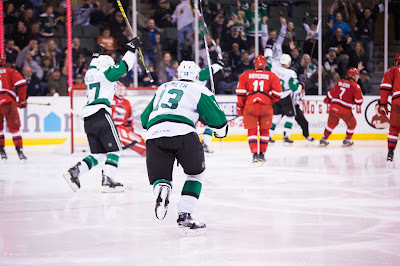 Shore notched points in eight of his nine games played during October, beginning on Oct. 10 when he netted the game-winning goal in the Stars’ 5-4 overtime victory vs. San Antonio. He scored twice in a 7-3 win at Chicago on Oct. 16, and recorded his first professional hat trick – including his first shorthanded goal – to lead Texas past Rockford, 5-2, on Oct. 17. Shore tallied the game-winner as Texas defeated Iowa, 4-1, on Oct. 25, and had an assist plus a shootout goal in a 4-3 loss at Milwaukee on Oct. 27. 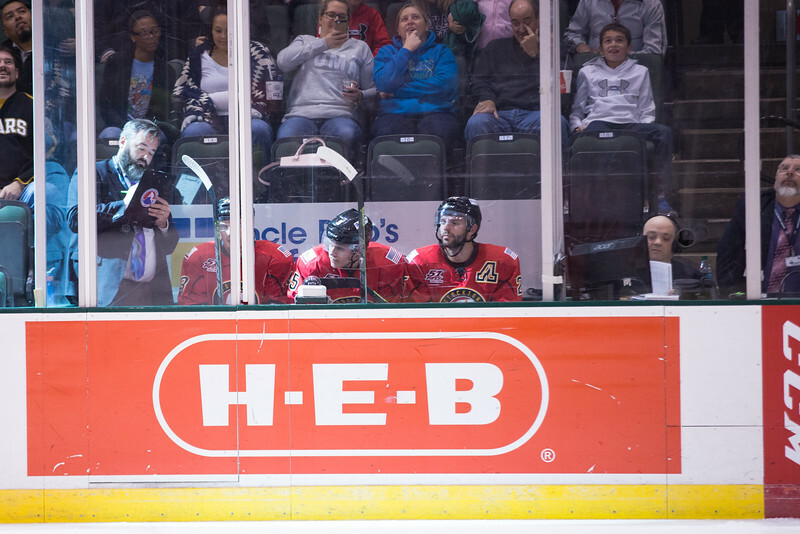 A 21-year-old native of Ajax, Ontario, Shore leads Texas in scoring and ranks second in the AHL in goals (8) as he begins his rookie professional season with the Stars. Shore joined the organization following three years at the University of Maine, making his pro debut last spring and tallying four goals and two assists in 19 AHL games in 2014-15. Shore was selected by the Dallas Stars in the second round (61st overall) of the 2012 NHL Entry Draft, and earned his first NHL recall by Dallas on Nov. 1. Today is Election Day in the state of Texas and one of the ballot measures, Proposition 4, could have a big impact on the gameday experience at your next Dallas Stars game. The measure would allow professional sports teams in the state to conduct popular 50/50 raffles that many fans may be familiar with from other markets across the hockey landscape. However, the measure won't affect the Texas Stars or any other minor league team in Texas. 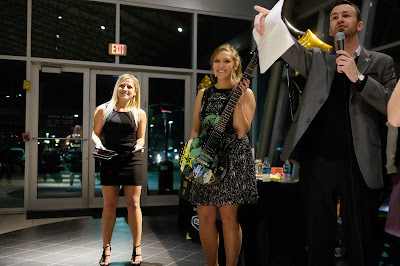 Jason Farris, board chair of the Dallas Stars Foundation, notes that the 50/50 raffle is "part of the culture of hockey in lots of other markets around North America." A 50/50 raffle is a massively popular charitable raffle in many US states and Canadian provinces. 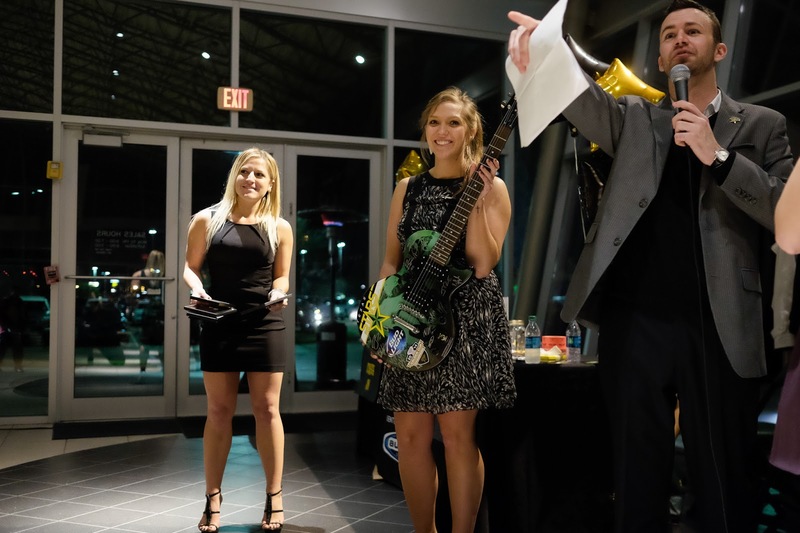 In a 50/50 raffle, each participant buys a ticket and the total amount raised by sales is split down the middle between one of the raffle purchasers and a charitable foundation. You may have seen some of these drawings happen during intermissions on away games when you've watched on AHL Live. Several thousand dollars can be raised this way. For example, the 50/50 raffles in Utica this season so far have raised an average of $7,774 for charity and the same amount has been given away to one lucky winner each home game. These raffles have been banned in the state of Texas because the state is the only entity currently allowed to operate a lottery. Proposition 4 nominally allows "professional sports teams" to operate these types of raffles in the state. Unfortunately for Texas fans, even if the measure passes, the Texas Stars Foundation will not be able to operate 50/50 raffles. For the purposes of the bill, professional sports teams are limited to only major league teams. "We began the [lobbying] process before we owned our minor league team," said Farris. "We're focused on the Dallas Stars Foundation. The crew in Cedar Park runs the entire operation down there. [The major league teams] collectively got together and decided it was something we would push for at the major league level." He added, "It's not something we're pushing for right now. We've only concentrated on the NHL team." The measure allows teams to get started as early as January 1st, 2016. Farris hopes the Dallas Stars will run some experiments with the raffles late in the season and make it "a mainstay of a long playoff run." Of course, all of this is contingent on the measure passing. "We really hope this goes through. It's hard to see what the downside is. We'll put a lot more money back into the community. We've really been trying to get back into the community more since the ownership change. It would allow us to amp that up a lot." After a slow start, Texas came back for the second time in as many games to defeat the Bakersfield Condors 4-2 this afternoon. "I thought we looked a little sluggish," said Derek Hulak, who scored his fourth of the season. "But that's something we addressed. The coaching staff let us know, and our leaders stepped up and let us know that start was unacceptable. We got solid goaltending again and we were able to grind this one out." Former Condor Maxime Lagace was under siege in net for much of the first but stayed strong to keep his club in it with 11 saves on 13 shots in the frame. Jason Dickinson noted, "He's made huge saves in key moments and that's all you can ask for from your goalie." 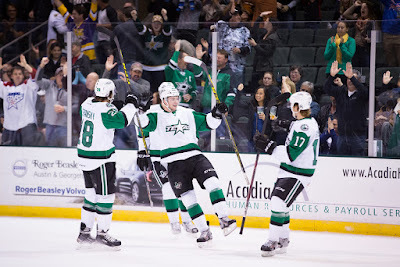 The Stars got scoring from all over the lineup, which was recently depleted by the loss of the leading scorer, Devin Shore, to NHL recall. "It's a different guy every night stepping up," added Hulak. "Greg Rallo did a lot of things that may have gone unnoticed. A lot of those things off the scoresheet are leading to our success this year." Coach Laxdal said the club leaned on that structure and game plan as they went into the second and third to win the game. Down by two early in the contest, the Stars could have easily been down by five or six if not for Lagace. Jason Dickinson cut into the lead in the 12th minute. Cole Ully and Matej Stransky generated the play with a strong forecheck to force the turnover that ended up on Dickinson's stick. From there, it was all Texas. Derek Hulak worked a rebound into the tying goal in the second. "Just get to the net," said Hulak. "Pucks and people to the net. I was lucky enough to go there and get it." Cory Kane redeemed himself for Friday's discipline issues with his first as a Star in the third. Again crashing the net to follow up on a shot from Branden Troock, Texas took the lead 3-2. "It's great to have that depth scoring," said Coach Laxdal. "We had 15 forwards to start the season wondering what we were going to do with all these guys. When the guys we have have been put in, they have responded. We're starting to bond as a family and you saw that with some of the scrums in front of the net." Justin Dowling added an insurance goal on a tip of a Derek Hulak shot to set the final score at 4-2. Texas now gets 5 days without a game to rest and practice up. San Antonio comes to town on Saturday. Texas again rolled their 4 winger pairs through 3 centers. Lines may have shuffled through the night, but this is how they started. With a few forwards ailing in Dallas, the Stars have announecd this morning that rookie Devin Shore has been recalled to join the club for their road trip that will start tomorrow. Shore's potential first NHL game will be against his hometown team, the Maple Leafs, on Monday. In terms of scheduling for Texas, it's a pretty ideal time for the center to be recalled. Texas has just two games in the next week while Dallas takes a four-game road trip. Shore, of course, has been tearing up the AHL with eight goals and three assists so far. He is the Texas Stars' leading scorer, but Travis Morin (3-7=10) is hot on his tail and may surpass him with this recall. Texas has one spare forward (Gemel Smith) to put in the lineup and, in a pinch, could play a defenseman at forward. A recall from Idaho could be coming later this week before the game against San Antonio.